Lock in a great price for Elements Beach & Nature Resort – rated 9.1 by recent guests! Nice for a remote location to relax / unwind. Good for kite surfing. Resort has a nice, rustic set up. Very chilled. I loved my treehouse and especially the tree shower. The design and use of natural materials was gorgeous. Spacious and lots of outdoor areas which were very private. nicely designed, comfortable bungalows. relaxing terrasse with bean bags and plenty of books. The taccomodation was a great concept. The staff were fantastic, expeially Dileep, who Aleays went out of his way to make sure everyone was comfortable. Five stars for him. Very eco conscious, no single use plastic, mostly vegan/vegetarian food, use of natural materials etc. Dolphin watching is a must! Very beautiful secluded resort with private villas. Good sri lankian food. We have just spent 4 nights at Elements and it was truly amazing!! The accommodation, food, staff, location, activities... everything was wonderful! We booked out one of the cabanas which was beautiful and let’s you get back to nature! You can fall asleep to the sound of the waves and wake to the birds singing in the palm trees. Truly paradise. All staff were so friendly as well and helped us sort out transport and activities so easily! We have left feeling truly chilled . :) We will be back!! 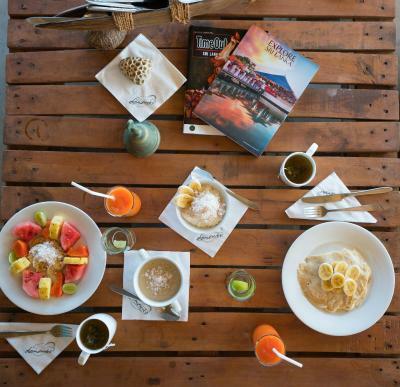 The accomodation, the surroundings, the clean beach (although winding as expected as kite surfing it the main activity there), the wild donkeys environmentally conscious, the buffet breakfast and dinner were delicious with a lot of variety,the staff were friendly and helpful. It was beautiful there. Beautiful beach and lagoon surrounding hotel. Plentiful wildlife and wonderful friendly staff. Featuring a private beach, the eco-friendly Elements Watersports & Nature Resort sits on the banks of the Kappalady Lagoon and Indian Ocean on the north-west coast of Sri Lanka. It is 1.9 mi from Talawila Church and Palakuda Junction Bus Station. Free Wi-Fi is available in public areas, while free parking is available on-site. The rustic bungalows all come with a patio with seating. Inside, there is a fan and personal safe. Private bathrooms are equipped with a shower. Elements Watersports & Nature Resort is 19 mi from Palawi Junction Railway Station. It is a 2-hour, 30-minute drive from Colombo Bandaranaike International Airport. From November to March, daily boats depart from the resort at 06:30 to watch dolphins and whales. From May to September, guests can enjoy kite surfing with the strong winds. Guests can also enjoy water sports such as snorkeling, or rent bicycles to explore the area. Both Asian and Western cuisines can be enjoyed at the on-site restaurant. In-room dining is possible with room service. 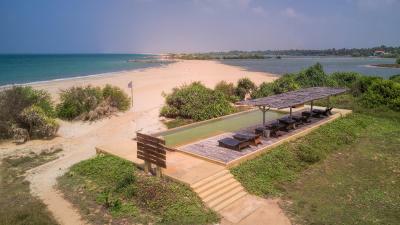 This property also has one of the top-rated locations in Kalpitiya! Guests are happier about it compared to other properties in the area. When would you like to stay at Elements Beach & Nature Resort? This cozy bungalow comes with a patio with seating. Includes a fan and personal safe. 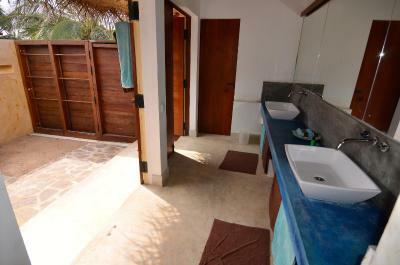 Private bathroom has a shower with hot water facilities. This bungalow has a balcony, seating area and patio. Also includes an open air shower. No hot water provided in this accommodations. Shower water temperature approximately 27°C. 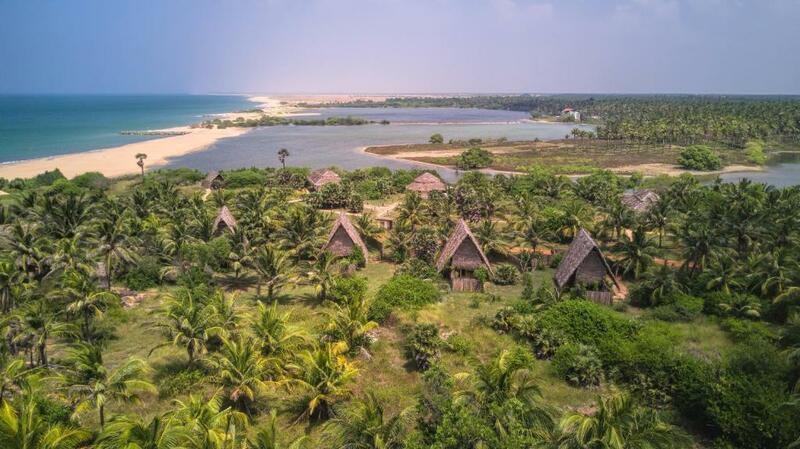 Experience an eco nature resort on the Northwest Sri Lankan coast at its best. A place to feel home and immerse yourself in nature. 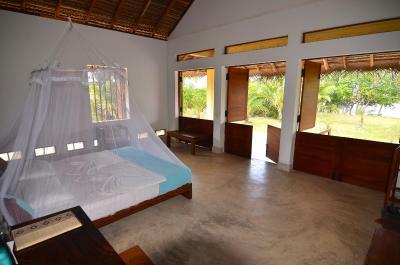 A resort that is based in the jungle area of the Kappalady lagoon located right at the beach. Surrounded by tall coconut trees and lush greenery, Elements is a true haven to sit back, relax and let go. With the lagoon and the beach at just a stone's throw away, it offers to be the perfect location for kitesurfing, standup paddling (SUP) adventures and makes it a fantastic starting point for dolphin and whale watching. ​ Sitting in the lounge of your lagoon villa you may just wait and let the various rare water birds like king fishers, sea eagles and waders pass or fly by. 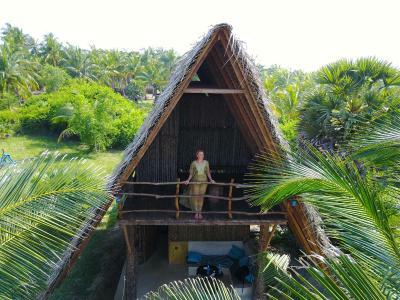 ​ We have built our villas and bungalows with 100% indigenous materials mainly coconut leaves, wood and concrete. We use the cooling effect of the persistent wind to cool our bungalows with a clever and efficient ventilation and insulation system - thus not requiring A/C we manage to "be green" and contribute to the reduction of your carbon footprint during your holiday. House Rules Elements Beach & Nature Resort takes special requests – add in the next step! 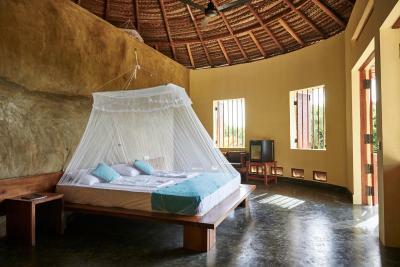 Any additional older children or adults are charged USD 39 per night for extra beds. Elements Beach &amp; Nature Resort accepts these cards and reserves the right to temporarily hold an amount prior to arrival. Elements Beach & Nature Resort accepts these cards and reserves the right to temporarily hold an amount prior to arrival. Staff didnt know much about festivities in the surrounding area. Bycycles for rent very expensive. Will suggest light & fan outside for the private lounge villa . I know there is mosquito but it’s nice to hang out in eve with privacy & closer to your room . The water is heated by solar power so sometimes the showers weren't as hot as we would've liked if we showered early morning or late at night but that is expected. It would've been nice to have a massage or day spa treatment on site. The staff helped us organise a driver to Colombo which was wonderful. However, the driver was already quite expensive and when we got to Colombo he expected us to pay for his freeway tolls to return to Kalpytia! None of the other drivers that we had ever asked for additional money. As it’s off the beaten track remember that you will pay extra for lunch menu & drinks outside of meal hours as there are no other restaurants around. Didn’t want to leave. Clean, almost-private empty beach, breakfast and dinner buffet, infinity pool facing the sea, natural cool air coming in to the room at night. 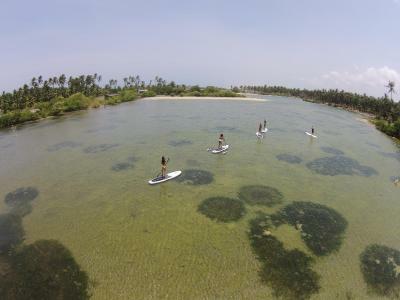 Paddle boarding down the lagoon area was a highlight. Highly recommend to anyone wanting to kite surf (include beginners), or other water sports such as paddle boarding. Great place to relax and unwind. Stayed in a villa for two nights overlooking the lagoon. Outstanding location, excellent facilities, very friendly and helpful staff. Delicious and fresh Sri Lankan food served at all times. Picturesque sunsets. Very enjoyable ocean/lagoon kayak trip, would recommend using a guide. Will be back for longer next time to kite surf! Unfortunately upon checking out we realised that we were charged 5200 rupees for 2 bikes for 2 hours! I don’t think that a hotel would even charge this in Australia! For a reasonably pricey hotel it really didn’t live up to expectations. - locations of huts was nothing special - food was very average! - the place felt a little soulless. We honestly had the most wonderful holiday here I wouldn’t know where to begin. The resort is so well put together, beautiful clean economical comfortable and sustainable all rolled into one great place. They really care about the environment and do their best to minimise waste, there is hardly any plastic used on site and they grow food in their own garden. The staff are so attentive throughout your time there, including those who give the kitesurfing lessons, as a beginner it was an awesome place to get a taster for this. This is the ideal spot for this sport, but there’s so much to do there beyond that. Even just as a spot to sunbathe and take in the incredible natural beauty of the place it’s idyllic - the beaches stretch for miles and there’s hardly any people there. The food here is also so good, I ate far too much at the breakfast and dinner buffets because I just had to try everything. The rooms are so special and comfortable and give you a chance to really immerse yourself in nature without being too exposed. I can’t recommend this place more. The place is amazing. A small paradise. Everything is great: The villa, the food, the staff and the landscape. It was a fantastic stay! We enjoy a beautiful villa with view on the lagoon. It was very relaxing in general. It is a small resort, so there are not many guests and that’s perfect so. The food is local and very fresh from their garden. Breakfasts and dinners were very tasty and also creative. The beach is very clean and the water at this time of the year very calm, you can really swim. The staff is wonderful, taking a good care of the guest and the Villa. All very clean. Additionally we went watching dolphins using the boat from the hotel and we saw quite many. And if you are fond off kite surfing, this is the place to go!